now if that info is correct, i have a problem the hoops seem to be the same size as the head so it doesnt seem to want to stretch over the head so it just sits on top, now is there something im missing or are the hoops the wrong size for the heads? I'm a little confuse as to what you mean? The bass head will sit on the drum, then the hoop should sit ontop. You will still be able to see the metal ring around the edge of the head on most bass drum hoops. It should be as easy as the other drums. If you can post a pic, that would help immensely! The hoop sits on top of the heads flesh hoop....... the crimp hoop on the head is under the wood hoop. Dude.......seriously. 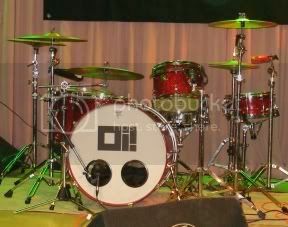 if you put the head on the bass drum it should hang over the shell a little, yes? then put the hoop on top of the head and it should be flush around the outside with the metal hoop on the head, yes? if yes then put the 'clips' (bass drum claws) and tesion rods on and tighten them up. in theory, the bass hoops and head are the same size (ie. you can still se the metal ring of the head when fitted), whereas the hoops on toms have a rim that cover the ring of the head. its pretty hard to explain and i hope i understood what you are trying to say. post pics if you are still unsure! ThePloughman wrote: The hoop sits on top of the heads flesh hoop....... the crimp hoop on the head is under the wood hoop. Dude.......seriously. Have fun bangin' away at your new kit! DrummerZ wrote: Have fun bangin' away at your new kit!